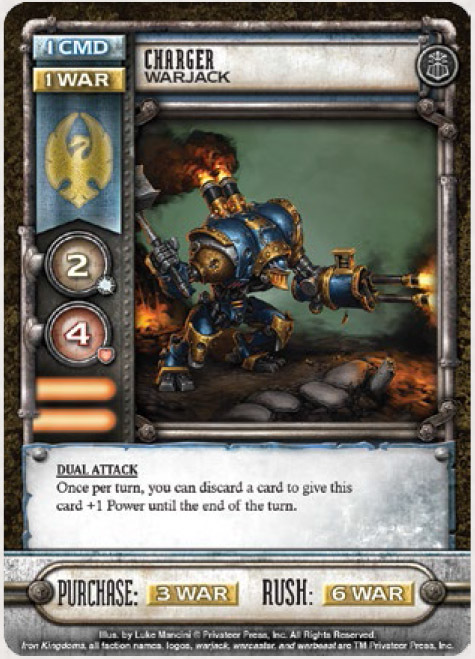 If you’ve been frothing at the mouth over the Warmachine / Hordes deckbuilder ever since Privateer announced it earlier in the year I bet you’re as happy to read this review as I am to write it. If you’ve not heard of it until just now, it’s time to dive into one of the most rewarding deckbuilders you’ll ever play. The premise of High Command is simple, it’s a deckbuilding war game set in the Iron Kingdoms universe for 2-4 players where you battle for control of key points within the lands of western Immoren. Currently available is the Warmachine set which contains decks of cards for the Cygnar, Cryx, Khador, and Protectorate of Menoth factions. Coming in October is the Hordes set that will contain Trollkin, Circle Orboros, Legion of Everblight, and Skorne, or if you went to Gencon like me you might already have a copy of the Hordes box. There will be future expansion packs containing mercenary factions and more ways to add more variety to the game no doubt though I’m not solid on those details just yet. To achieve victory in High Command you’ll be sending your troops into different areas of the Iron Kingdoms (represented by location cards) in order to capture them for victory points. Most location cards allow you to perform a special action once captured also. 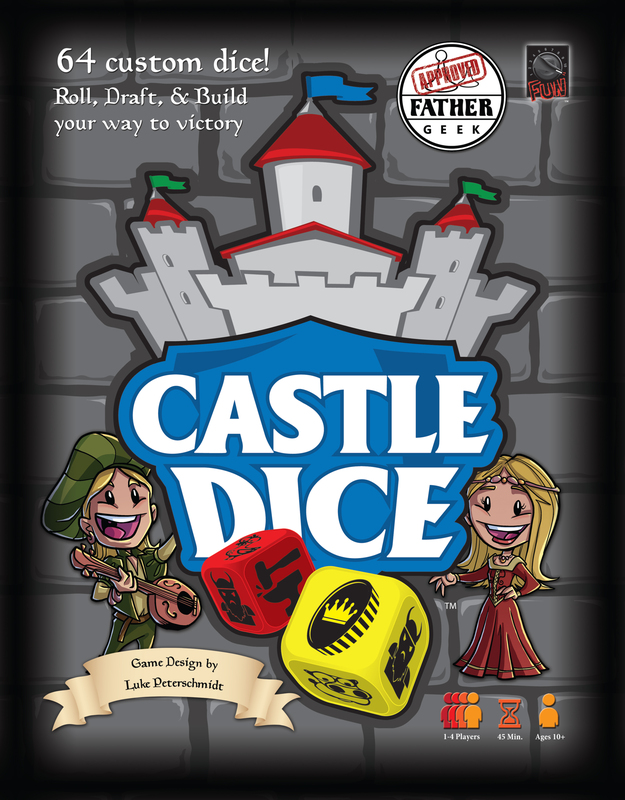 Starting with a small army deck of 12 basic resource cards, each turn you’ll begin to make purchases from your own personal reserve deck, which is comprised of 3 separate color coded “detachments” that you chose before the game that correspond with one of the colors of each of the 3 warcasters you also picked before the game. Detachments each have a separate theme/feel to them, but we’ll talk more about that later. From your reserve deck you’ll either be buying cards to put into your deck or paying their rush cost to send them directly into battle. 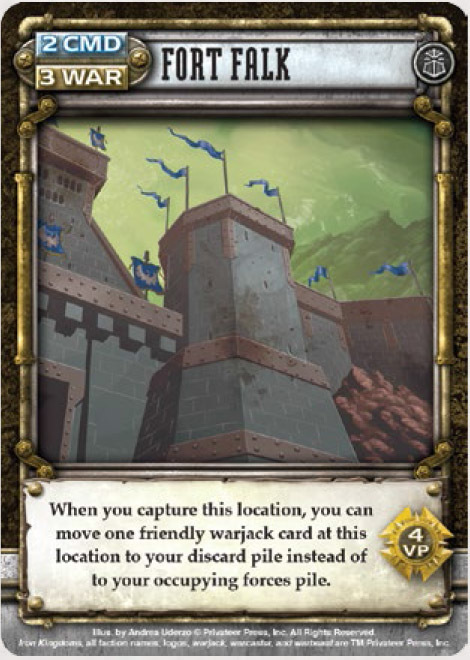 You purchase and deploy cards by discarding other cards in your hand for their point values which are listed at the top left and when doing so you must choose to discard them for either command points (CMD) or warjack (WAR) points, some of the really good cards are going to require you spend both! 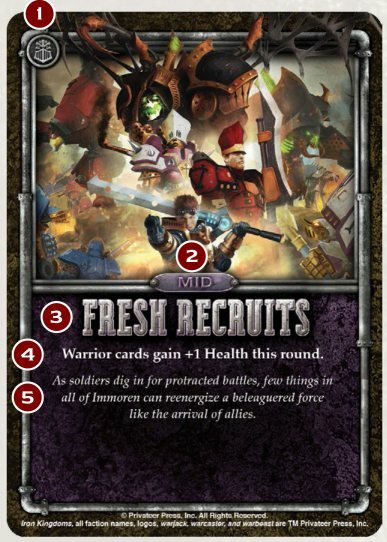 Also during every round of the game you’ll be flipping over a card from the Winds of War deck, these cards change the face of the battlefield and the tactics you might use. They might give a bonus health point to all warriors one round, or make your first purchase cost a little less the next round – the effects are subtle but still provide a nice variation to gameplay. The Winds of War deck is divided into 3 sections – early, mid, and late game and each section progressively ramps up flow of play. Early cards allow you to get moving faster, mid game cards might throw a wrench into your plans, and late game cards typically escalate the action into a nice crescendo at the end of the game. The game is over either after all of the location cards have been used up, or after the Winds of War deck has been depleted. Players will count up their victory points in their army deck and occupying forces pile and see who has the most, and after that you demand a rematch because damnit there’s still time for another game! You may have noticed that I didn’t speak too specifically to the mechanics of the game beyond what you might need to know about a basic deck building idea, that’s because I wanted to dedicate this entire section of the review to pointing out those facets of the game, which are also some of the biggest reasons I feel that High Command stands above most other deckbuilders out there right now. There are 5 big reasons (actually 6 or 7 but I thought I’d keep the list concise) why High Command really does stand apart from any other deckbuilding game I’ve ever played, a big part of it is strategy. There are a great many deckbuilders for some light and easy fun, but when it’s business time you’d better bet that High Command is getting slammed down onto my table. I am already dreaming about having a High Command tournament night at my house sometime soon. I’m not saying that high command can’t be light and fun, but when I play this game I can’t not get all serious about it! Anyway, here’s that list of reasons why HC should have a spot at your gaming table, especially if you love deck builders and/or strategy. Warcasters – These powerful characters are selected before the game and are always at your disposal. Choose wisely though, because they are each a one time use resource and after your battle step they are gone. They can turn the tide of a battle but you only have 3 to use during the course of a game so you’ll have to use them wisely. This kind of limited resource that is up to the player as to when/where to use them is extremely unique and adds a lot to the overall feel that High Command evokes. 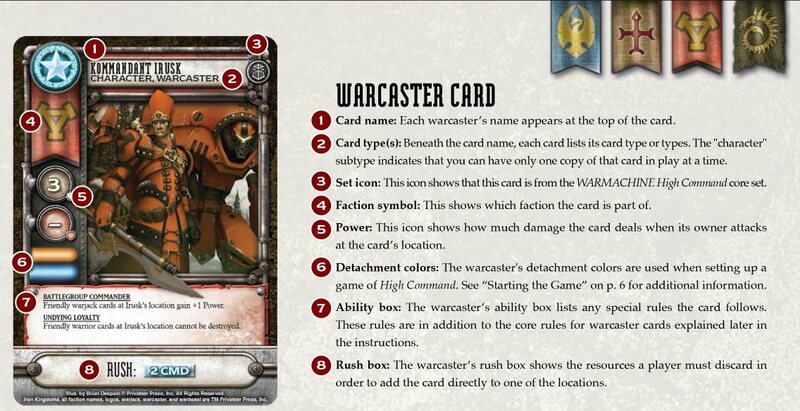 Detachments – Your deck is comprised of 3 different detachments, of which you’ll choose from a total of 6 that match up with the colors of your selected Warcasters. This relates back to the overall strategy you are aiming for with your warcasters and also provides a lot more customization than other deck builders where you’re just drawing through the same huge pile of cards every game. Each detachment has a different theme/feel to it and mixing them up creates a really unique feel to the way you play. The replayability here is extremely high. It’s Refreshing – Refreshing cards lets you discard a single card from your hand to cycle a single card from your reserves back into the bottom of the deck and replace it with a new one. If you’re not happy with your possible purchases sitting in front of you, you don’t have to wait for some special circumstance to get new cards, just refresh one of the reserves! Take It To the Bank – Each round you can bank a single card (by default, other cards might allow you to do more) and hold it over for your next turn. Do this for strategy or do it just to hoard some resources, you still get to draw your normal number of cards, this just helps add to the whole planning and strategic aspects of the game. Once again, strategy! Culling Is Built In – You don’t have to wait to score victory points, or hope that some card comes up in a draw that will allow you to shave a no longer useful card from your deck, you just do it. Every time you run out of cards in your Army Deck (draw pile) you are allowed to remove one of those cards from your deck permanently. This really helps you streamline your deck and cut out the fat without having to rely on luck. As with everything Privateer Press makes the quality of the components is superb and the artwork is jaw dropping. You’ll definitely want to buy some card sleeves for High Command, not to make up for shoddy quality but to ensure that you protect the exquisite cards from wear and tear. The box has more than enough room for each faction, you can definitely fit both the Hordes and the Warmachine cards all into one box with room to spare. The box also accommodates for the size of cards once put into sleeves (and not just cheap sleeves but the nice UltraPro kind – like in my video) which is great. My only gripe with this game in any way shape or form has been that the detachment colors are very faintly differentiated and so for color-deficient people like me that means I’m usually having someone double check my detachment sorting before the game (it doesn’t matter at all after you’ve started) so I feel kind of lame going “Is this red or orange”? For a closer look at what comes in the box be sure to check out my unboxing video (this video is a placeholder, higher res w/ less yammering coming 8/29). High Command has an overall feel of permanency, strategy, and control over your own in-game destiny. 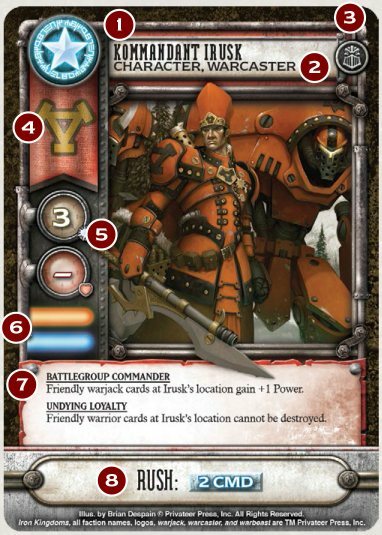 When your units capture a location, you win that location card to go into your deck for resources but the units that you had there must go into an “occupying forces” pile for the remainder of the game. They are essentially holding down the fort while you continue to battle so you won’t be seeing them again for the rest of the game, this makes you pick choose your battles even more wisely. There is so much strategy and tactical thinking you can put into High Command it’s unbelievable, there are always so many decisions to be made on each one of your turns. It’s great to feel like you have the power to turn the tides of your game, and each one of the factions really does have a very distinct feel. Mixing up the Hordes and Warmachines factions makes for some truly epic battles, I really can’t wait to see what Privateer does next with the upcoming expansions. I should also mention that in multiplayer games (3-4) players you can choose to focus your attacks on just one player who also has units at a location you’re fighting for or to just all out attack everyone, which can make for some nice opportunities for diplomacy. I’m also wondering about the possibility of trying to play an 8 player game with all 8 factions but I’m assuming that might break something, I’ll try it at least once though! The game is probably best learned with 2 players but immediately afterward you’ll be ready to throw more players into the mix, if you’re more advanced players you can probably jump right in at 3 or 4 players. The game is really simple and super easy to pick up on and teach to other people, even if they aren’t Warmachine or deck building fans. I think that High Command is truly unique to its genre and that if you don’t grab yourself a copy, you’re truly missing out. 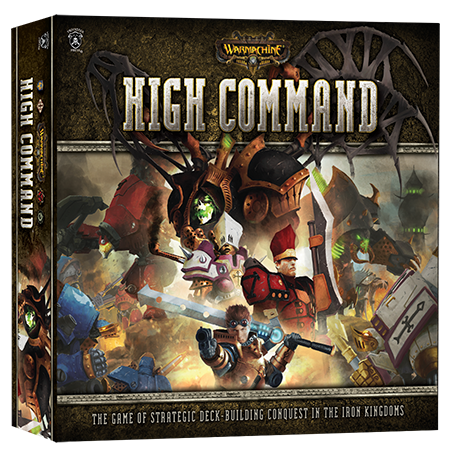 High Command launches today so run out to your local game shop (or head on over to Amazon [$35]) and nab one off the shelves before they are all gone, and be sure to keep your eyes peeled in October for the Hordes set to be released as well. Until next time, thanks for reading! Have you tried Core Worlds? It is currently my favorite deck builder. I know they’re very different, but I’m curious what other deck builders you enjoy to get a sense of your preference. Marvel Legendary is good, but it’s a little too convoluted for my tastes. I’ll definitely keep my eye on this one! 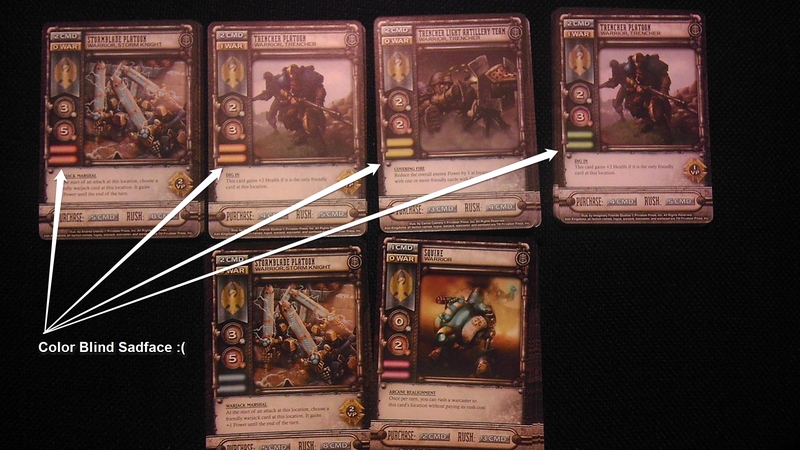 About the detachment color issues: is the card material appropriate, for, I don’t know, using permant markers? I agree that it’s an issue they should avoid in future reprintings/expansions (be it using more contrast between each color or also using a letter/symbol/graphic key to each color near the colored bar. I’m just wondering how hard it would be to make a home solution.